Sometime ago we mentioned details about a new cash back credit card that was going to be released from Tangerine. 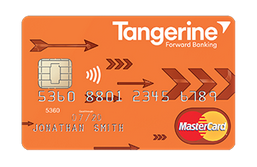 Well it was released about two weeks ago which means the new Tangerine Money-Back credit card has been added to our Cash Back comparison chart. The card provides up to a 4% return for the first three months then a 1 to 2% return after. See how this card compares to other cash back cards here. - 5,000 Saga Club Points when you take advantage of the Icelandair stopover program on an Icelandair flight. More... Until ?